First off a little history, Rakeriku has been around since late 2005. I joined them as a noobie january 2006 after a month of Eve University. The corp was buzzing with activity then. We had an online shop, build a lot of ships and had well attended mining ops. But after a while people moved on, and the core of the corp (about 8 people or so with alts) remained. We’re all relatively old characters now. Independent with plenty of isk to back us up. And that’s where the problem lies :). When you’re a few months old, a mining op with a few vets is great, but once people grow older, running missions is more lucrative, and start doing that. Mining ops get attended less, people move on to other ventures etc.. So now here we are 2 years later (give or take) and corp chat has become more of a chatbox. Everybody is off to do their own thing (me included). We did a bit of recruitment earlier in the year, but only a few of the people that joined stuck around. We just don’t have that much to offer to newer players, besides our knowledge (uhm) of the game ;). setting up a POS in hisec for research which will need maintaining etc. pos in low sec for carrier production. This will need minerals so mining might be interesting again. looking into level 5 agents for group missions. No experience with this yet, if anyone has speak up :). Are the systems camped by pirates or are people not bothering with it ? looking for other corporations to join our alliance. This will get us in touch with other people we can help out or work together with. Regarding that last point: If you’re an industrial corp big or small, looking for a nice alliance to join to minimize the wardecs, have some friendly experienced players to chat to and help out with mining and production, contact me in game and we can talk about it. Just to be clear, we have nothing against pvp, but we don’t have anything to offer pvp corporation. If anyone can offer more advise for revitalizing a corporation, please leave a comment ! Ofcourse our recruitement offer is still valid as well (except for the 0.0 part). My corp is now recruiting new members. You can read more on the official forum or at our own forums. – A launch pad for those wanting to learn. – We wont exploit you and force you to work for free. – 0.0 access to some of the best ores (Arkonor) and ratting. – Regular mission runners (who don’t mind folks tagging along). – Plenty of salvaging for those folks not ready to join in the mission running. Posted on May 11, 2008 Author MorphisatCategories rakeriku1 Comment on Rakeriku is recruiting ! OMG I R IN THE 0.0 ! The ceo of Rakeriku and Otaku Invasion Carv stepped down due to being to busy a while back and the new Ceo Rag, wanted to blow some new life into our corp . The best way to do that was to go into 0.0 ! 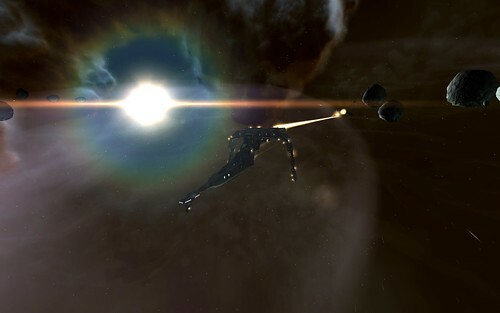 We have a close group of people in Eve, very skilled and knowledgable as well, but everybody was getting a bit bored and the corp was slowly dieing. So the move to 0.0 seem to be a logical one. Some people already had 0.0 experience and they’re helping us 0.0 noobs along, answering all our questions. So yesterday we moved some of our stuff over by carrier jumps. I now have a sacrilige for Belautis and a cerberus for morph in 0.0. Have only done a little bit of ratting, and it looks good so far. Already made a few million and got my cargohold filled with loot (which isn’t too hard today). Wicked Creek has Angel rats, so explosive ammo seems to work best. Though on the cerb, due to bonuses, the kinetic missiles are nice. It takes a bit of time to take the big BS’s down, but as long as tanking isn’t a problem, it’s not too bad. Luckily Bela can help me out if I step into a 3 BS spawn, like I did today, they spawned right on top of me and had my heart skip a beat ;). Ofcourse playstyle is a bit different out there. You have to keep your eye open on the security channel and local. And because you’re renting space, that doesn’t mean there are no pirates or people with ill-intend around. 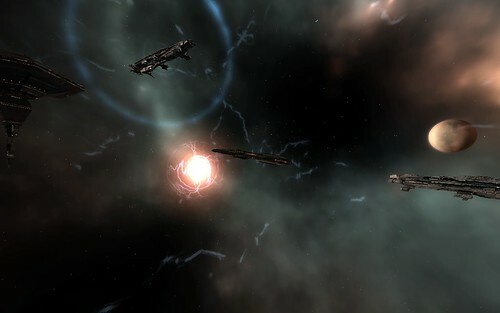 Already yesterday when I was just going to put up a Cyno for the last jump, two hostiles got into the system. But luckily they buggered off, so I was able to put the Cyno up in the end. I am sure i’ll keep you all up to date on this new step in my Eve Career ! Two weeks ago The Otaku Invasion of which my corp Rakeriku is a member, was war-decced by Hooligans of War. A small pvp corp, looking for some kills in empire space. What they probably didnt know is that OI has quite a few experienced Eve players as members. The rakeriku industrial flag is no longer very accurate as some members do also engage in Pvp regularly or have done that in the past. So after the week the war was over, HOW had heavily underestimated the strength of OI. Some losses on our side, a few cruisers and frigs. On their side however, a few Hacs and recon ships. You can see the results on our killboard. Thanks to Hitman47 some fights were recorded on video ! Unfortunetely, I logged on at the wrong times and managed to not be part of the action :(. I did fly around a bit in my Covops ships cloaked though ;).